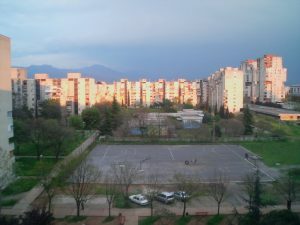 Blok 5 was built between 1977 and 1984 as a brand-new quarter of Podgorica, based on a meticulous urban plan by architect Vukota Tupa Vukotić (1932–2002) and envisioned by architect Mileta Bojović (1941). The neighborhood consists of 13 buildings, housing approximately 1800 units. Bojović strived to achieve a dynamic effect, in order to express the importance of active citizenship in public life. He did this by creating an array of buildings that appear like they’re about to move, to jump into action – although they are very stable structures, and widely praised for their earthquake-resistant construction. Vukotić created an urban plan that includes plenty of space for communal functions – shops, schools, kindergartens, health services – and provides the whole residential area with a cloak of extensive greenery. Pedestrian walkways and natural playgrounds bring the community together. 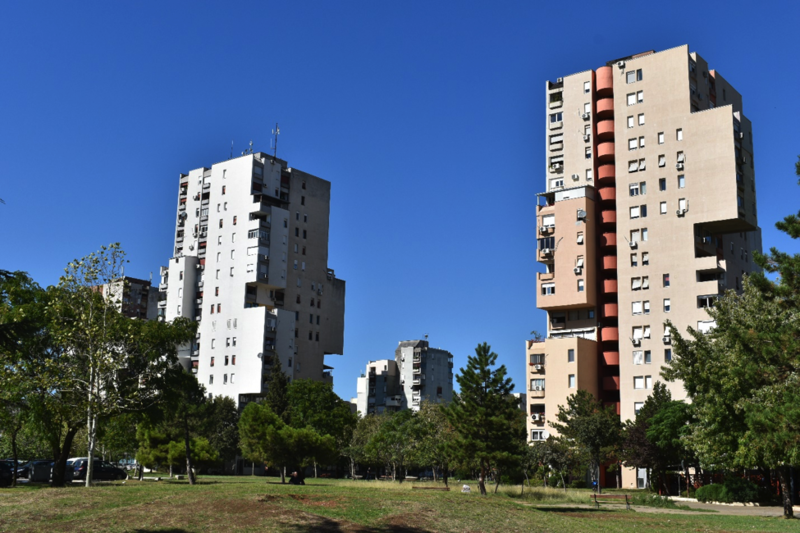 Forty years after its construction began, Blok 5 remains the greenest urban quarter in Podgorica. 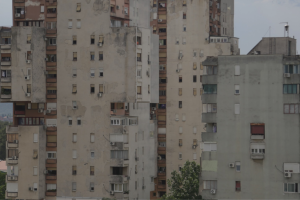 This interview with Mileta Bojović (conducted, edited, and translated by Sonja Dragović) took place in 2016 as part of the project Architour.me, aimed at increasing and spreading knowledge about Podgorica’s post-war modern architectural heritage. The project was created and implemented by the Gradio group, a collective of students and young professionals working in the fields of architecture, urbanism and ecology. Tell us about the very beginning – how the Blok 5 housing project came to be? At the beginning of 1977 a competition was announced, in accordance with an already adopted detailed urban plan, and it asked for an architectural solution encompassing all residential buildings in the plan. The construction began on October 1, 1977. The buildings were erected one by one, which was a standard practice, and I think the construction went on until 1983 or 1984. People started moving in gradually as well. Indeed, Blok 5 may only now be starting to live in its full swing and strength. It is difficult to understand today how housing was planned and organized at the time. This was during the era of self-managed socialism, which now everybody forgets and criticizes, but which had its advantages, especially in the field of urban and overall planning and design. That is primarily because it was advocating – from theory to practice – putting people into action. The exit from a totalitarian regime (communist at the time, capitalist today) was sought through self-management, as a process through which all people were to get involved in all decision-making bodies and procedures concerning their livelihoods, from labor organizations to state institutions. One of these organizations was in charge of housing: The Self-governing Common-interest Community of Housing (SIZ). These communities had collected money from labor organizations and institutions, in order to organize housing construction on behalf of the self-managed society. Then they distributed the newly built apartments on the basis of individual labor organizations’ participation in covering construction costs. People were working, and logically, besides their salary they should have had some other benefits so that they could live a normal life, and that they could, after all, be able to work. Housing was one of the basic needs, and the SIZ [for housing] was the organizer of the entire undertaking, from planning to construction. I think the urban plan was completed and adopted in 1975. The implementation began two years later. Of course, the SIZ did not have enough money to start building the plan all at once, and we didn’t have the necessary technological or construction capacities. We put the buildings up one by one and carried out the project in a relatively short period of time, given the circumstances: 13 residential buildings were constructed, along with additional lower spaces designed for the everyday activities and the needs of the people living in this community, including healthcare and grocery shopping. The capacity i.e. 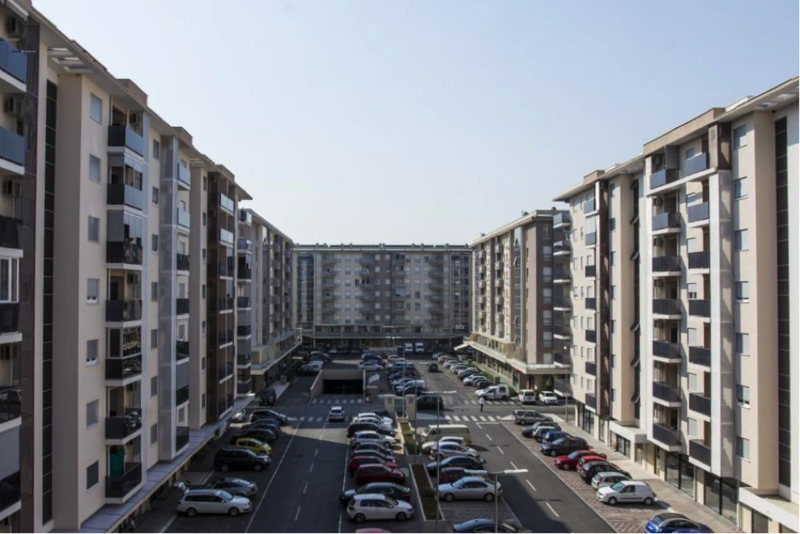 the number of apartments was around 1,800 and the net surface area was approximately 150,000 m2, with the gross area amounting to 180,000-190,000 m2. There were some imperfections and omissions, as always happens with large construction works, but I believe this was still a vastly successful undertaking for that time. It seems to me that even today, with all our advances and achievements – both democratic and in terms of human rights – we don’t have nearly as good results when it comes to providing people with proper living and working conditions. The urban plan for this area had a great deal of influence on your proposed architectural solution for this residential block, is that correct? Certainly. The author of the plan was my colleague Vukota Tupa Vukotić – I say the author now, even though at the time authorship of urban plans did not exist. It was a social activity and we all participated in that process, we adopted the plan together, and no one guaranteed the authorship to anyone – not even in the implementation phase. The society had, so to speak, a monopoly over planning processes. This plan was brilliant, and as such, it was adopted and we stuck to it. When we analyze the urban plan of Blok 5 today, we should keep two things in mind. First, the boulevard that stretches along the south side of Blok should have ended on the former Marx and Engels Street (Moscow Street today), with the pedestrian area continuing all the way to the Tološi Forest Park. Second, the boulevard was supposed to be built on Dalmatian Street. At the time when the urban plan was developed, it was logical to place the entrance to Blok 5 on the north side – from the future boulevard, one of the main city arteries. Time has passed, and things have changed: while we were still constructing Blok 5, the boulevard on the south side was extended. That decision was made outside planning procedures and bodies – it was a political decision, and this new part of the boulevard entered into official plans. Because of this, the main entrance to Blok 5 stayed on the relatively smaller Dalmatian Street. It has been somewhat expanded recently, but it was quite modest for a long time, making it a bit harder to access the center of the neighborhood. The entry from the south side was open to pedestrians until 10-15 years ago, when a fence was set up: now it’s almost impossible to enter the area from one of the main city roads, and if you want to try, you must look for some hidden openings and passes. I am saying all this in order to explain this illogical twist when it comes to accessing it today, since the entrance to Blok 5 is tucked away onto a side street, while the supposed main way is blocked by metal fences and grates. This has been, as we can see, the result of decisions and obstacles created in both present and former times. There is one more section where the project diverges from the original plan. At that time, the public was opposed to the construction of tall buildings. This fashionable attitude reached Podgorica as well, and all institutions, local communities and SIZs went on to support an initiative to reduce the number of floors in the new plans – the discussion went as far as to say we should not construct any new buildings taller than eight floors. So, it was my job to try to ‘ground’ the structures, which meant that, compared to the original plan, buildings were to be brought down an average of three to four floors. With this, the upper regulation of the structures was ‘calmed down’ – it used to be much more dynamic, as that’s how we designed things at the time. I must admit that this intervention was actually going in my favor – there was no reason to look for some dynamics at such a height, which cannot even be perceived from the pavement level, from the pedestrian positions. I then sought the dynamics in the very buildings. Tell us more about how you came up with this particular design. The buildings of Blok 5 still draw attention and curiosity even to this day. To explain this, we also need to go back to the time of self-management, and to remind ourselves of everything that happened in the areas of philosophy, sociology, art, and architecture during this era. Humanity was at the center of it all: the focus was on the role and place of humans as users for whom everything was being made, around whom everything revolved – the plans, the cities. Many Western thinkers took Yugoslavia as a paragon, for it was among the first to introduce the system of self-management. I have to mention professor Henri Lefebvre, who was very influential at the time. He was a philosopher-sociologist who did important work in the field of urban sociology; his book ‘Right to the City’ was very popular, whereas in ‘The Production of Social Space’ he wrote lucidly about the relationship between man, society and the city, which has changed and evolved, but persisted throughout human history. With this project, I started my own research of these complex relations. In the last couple of decades, the dwellers of these buildings have taken it upon themselves to modify and change them in a series of dubious interventions, thus violating their appearance and original structure. How does this fit with the idea of people being central to the development of a city? Well, even the best intentions sometimes turn out badly… As they say: no good deed goes unpunished. The concept of Blok 5 in the self-managing system implied a major spatial intervention, which could have been realized through monotony, die-cutting, prefabrication, and thus simplification of all forms, that is, through fitting everything into the mold: first houses and flats, then their residents. My ambitions were contrary to all that, I wanted to individualize the structures and make distinctive buildings and neighborhoods. Luckily, this vision was accepted and supported, but not by my colleagues – the constructors, urbanists, architects – but by the politicians. We had a sort of paradox that the politicians in the era of self-managing socialism were more progressive, more advanced than us users, urban designers, and planners. I wanted to, in addition to the exterior, make the interior of the buildings as usable as possible: to allow users to adapt their homes to their own needs, habits, and desires. All internal partition walls, except the sanitary block, are movable – they can be screwed, unscrewed, moved to the left or right, or completely removed. The project offered solutions for all these different options, we developed all the plans well in advance. However, the bureaucracy made the process of getting to know residents’ preferences more difficult than we had anticipated. Representatives of the SIZ, who spoke for all these people, made decisions and chose solutions on their own. There was no way for me to get in touch with the final users; mediators had chosen the solutions to be implemented, and so we designed the apartments according to their instructions. I was hoping – and I expected, given the technical possibilities – that people would begin to make some changes and adjustments in their dwellings, and I was available to everyone who needed help or consultation. In the end, it turned out that there was not much interest in changes within the private space. The common terraces, planned as large central spaces for neighbor gatherings, drew much more ‘attention.’ Now almost every one of them is appropriated, reconstructed, and occupied. Through its use, the original idea was turned completely upside-down; the possibility of choice, flexibility, and adaptation to one’s own tastes came to its complete opposite. Everyone accepted what was already done with the apartments’ design, people did not care about it, but they rushed to take something that was not theirs. Thus, the desire to seize and conquer was on full display, especially after the transition began. People started occupying common spaces, extending them, building up to make some new rooms, sheds, dog houses… Very creative indeed. They were even putting up new floors onto existing cantilevers, designed to safely carry their own weight, but not that kind of extra load. I protested and warned against this via the newspapers and on TV, but it all amounted to nothing. People persisted in their conquest with no fear or consideration – but with the tacit consent of the institutions that should have prevented this. This conquest brought nothing good to the communal green spaces either, is that right? The attack on green spaces started a long time ago. The city had planted the scions immediately, and now they are grown trees, but they had to be replanted over and over again because they were being destroyed for many years and broken countless times. The same was true for the benches. We were constantly confronted with this aggressiveness, especially in the period after 1990. I have already said before that Montenegro was mostly spared the war of destruction, but we did feel the consequences of those horrors. People’s instincts for destruction were palpable, and we also felt it here in Blok 5. Aggressiveness and dissatisfaction were first manifested in the public space: people seemed to take revenge by destroying the trees and benches, by parking on green spaces and driving on pavements and lawns. Then the architects came and they started expanding smaller buildings, originally designed for the needs of local communities – and they did that at the expense of the neighborhood’s green oasis. However, although the green spaces could have been better preserved, I think what’s left of them is still much better than what we now have in other parts of the city. The interior areas of the neighborhoods across the Morača River were filled with green spaces and children’s playgrounds, until these were used to make several new buildings to be sold in the real estate market. This happened because profitability was more important than anything – both for those who run the city, and for those who build it. Green spaces that were cultivated for decades are now being replaced with new developments and covered in parked cars, because the construction of a proper parking garage would reduce profits. This is how the chaos in which we live now was made. We can also compare it to the newly built quarters. I think City Kvart, developed across the street from the Delta Shopping Mall, is currently the most expensive and the most popular neighborhood in Podgorica. One could even say that if you don’t live in City Kvart, you don’t have a right to citizenship. This location has become a symbol of status and prestige. If we compare the urbanism of Blok 5 and the urbanism of City Kvart, and the buildings of these two neighborhoods, we must ask ourselves what kind of people – defined by interests, cultural affinities, and education – promote City Kvart as being of outstanding quality, both urban and architectural, while simultaneously criticizing Blok 5. While you were working on this project, how did you balance the desire to achieve your own vision with the needs to satisfy the expected form of a residential block? We can see that ideology inspired the function, but that the form had not been sacrificed in that process – that’s an important success. I might be immodest, but at the time I closely followed developments on the European scene. I spent some time in France and got into urban sociology as a student of Henri Lefebvre. I went to Paris after completing my senior year in 1964 and I stayed there until 1969. That was, as you know, a very interesting period. I was lucky to have the opportunity to be in France at the time of culmination of European thought. These riots, students’ and workers’ demonstrations, a huge movement that in some way affected the entire continent – it was indeed a cultural revolution, with extraordinary ambitions and slogans such as the famous ‘Be realistic – demand the impossible!’ For this reason, I bring up utopia now: let utopia be unreachable, but keep the faith – the sheer faith in the ideal will help us make that necessary step forward. Without utopia, without an important goal, without a great idea to guide us, we cannot move in the right direction, nor can we transcend our limits. Machiavelli said something along the lines of: ‘Aim higher than you can reach if you want to reach your aim.’ So, the ambition should be much greater than the possible leap forward. The reality, indeed, begins here: we need to demand the impossible to achieve something that is real. In France, during the ’60s and the ’70s, we had experiments and entire upheavals in painting, sculpture, music, architecture. It was an attempt at a synthesis of art. Professors were also telling us about this over and over again, while they tried to make the synthesis happen in practice – I really think that this process gave us new artistic expressions that are still dominant today. If there was something that inspired me, it was the freedom of sculpture, freedom of painting. The boundaries were disappearing: it was difficult to affirm by using some standard criteria of what painting is, what sculpture is, what architecture is. Therefore, I went into this project with the ambition to achieve the synthesis, and I tried. I was denied the use of color, which should have been the final touch in making this work complete. What were the challenges set for you by the milieu you worked within? One significant contribution, or at least a sort of a technical breakthrough in the project’s design, was a plan to paint the facades of Blok 5, which I made as a special addition to the main project. This was a popular practice around the world at the time, but for Montenegro the idea was new. The colleagues who were against my project were looking for any chance to thwart and disable anything that was new, anything they were not used to. When we started painting the facades, in accordance with the original plan – we had already ordered the paint, the work was well underway – the opponents launched an initiative to stop it. The colors I chose were composed in a way that underlines and supports the structure, while highlighting the volumes, the construction. This negative reaction was nothing new: the story with which the idea of Blok 5 was originally second-guessed, when the colleagues opposed the individualization of buildings, was now repeated. They succeeded in stopping my plan for the facades, and in the end Blok 5 was painted in a way that diminished the playfulness and richness of volume in its structures. You see, every period has its own challenges – there probably isn’t an ideal time for architects and urbanists. Blok 5 was finally built thanks to constructors from Skopje. In the period from 1963, when a terrible earthquake struck Skopje, to the end of the 1970s when we started working on Blok 5, a fantastic team of constructors was formed in Skopje. Those were constructors educated in Japan, California and elsewhere; they had the Institute for Earthquake Engineering at the Faculty of Civil Engineering and it was certainly the best construction team in Europe. Since my project had been contested here by my colleagues from the Department of Urban Planning and Design, where I also worked at the time, I sought arbitration and was backed by the city government. We went to Skopje and everything turned around: not only was the project praised, but they also organized a local exhibition of my project, to showcase Blok 5 as an example of how a new, different architecture can be imagined and done in the seismic area. Could you explain what constructive solutions were applied here – to put it simply, how did you achieve the stability of the cantilevers? My thesis was that all the material that goes into the structure should be used, that the construction should not have any elements which don’t work, which don’t contribute to overall stability – let’s say I wanted all members of society and all parts of the house to be active and functional. We had regulations on how much rebar should be built into the walls. I wanted this rebar to work, because otherwise why keep adding the steel to the concrete walls solely because the regulations say so? I wanted to make the most of it, to use and activate it. So, it is about activating the material. We have concrete, we have rebar in it, why would we – statically speaking – just remain at the vertical, when we can take some of that material to the sides? I fought for the cantilevers to be up to 5m wide, although 6m would be possible too. There is no additional rebar, no additional concrete. We only used the material that would be used anyway, even if the building had kept only the basic vertical. 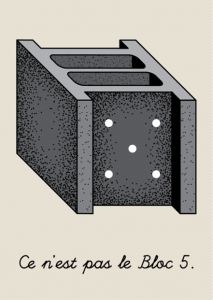 Reinforced concrete – the carrying, constructive element – could have been shaped as you wished. In the end, it’s simple: I didn’t invent anything new, I only used the knowledge of other people, from other areas. We keep going back to discerning the differences between present and the past… What do you think about the future of architecture and urbanism? “Keep upright!”: The Cypress Park P .. I must admit that the architects of my generation had advantages that are simply out of reach for those who are now entering the field. I have three children and they are all architects, and I must be concerned about their future. We, as architects, used to have goals: social, perhaps utopian, but they gave us the opportunity to defend ourselves at the theoretical level, to justify our ambitions and ideas. I had succeeded in doing so in front of Montenegrin party and state leaders. I had succeeded in reaching the decision makers and explaining the concept to them, explaining what I wanted to achieve with Blok 5 – and these people then gave me their support, because my plans were in line with of social and political goals of the society. Today, the main goal is profitability, profit above all, profit that will ultimately go somewhere else – it will not remain and materialize itself in Montenegro. It is difficult to find arguments for the creative approach, when everything is done only to increase the profit of the investor. What kind of form, what kind of architecture does it produce? What materials are used, what’s the quality of construction? All of this can be answered with a comparison between the past and present social systems, between the idea and the realization of Blok 5 and City Kvart. The way the shopping mall Delta City and residential block City Kvart are developing, which we could all follow closely in recent years, is no surprise: everything that is happening there is already foreseen in the books of the famous sociologists of XXth century: Lefebvre, and Baudrillard who succeeded him, and Marcuse. They recognized the signs and warned us that small shops, cafes and grocery stores would be destroyed – that we would lose those recognizable places on the street, in the neighborhood, where the people we knew and whom we had connections with used to work. All this will be replaced by huge shopping centers where all service activities will be carried out, but – which is particularly devastating – where cultural activities will be performed too. And here’s what we are now witnessing: the Delta City mall regularly organizes various cultural programs, with the support of state institutions, including University faculties. On the other hand, the houses of culture are neglected and destroyed. More than 50 years ago, expert analysis warned us that this would happen – but it didn’t help us much… Now we can only acknowledge the situation and conclude: it’s nothing new. Sonja Dragović earned her bachelor’s degree in economics from the University of Montenegro in 2012, after studying for a year at the University of Maine, USA, and for one semester at the University of Economics in Krakow, Poland. She obtained a joint master’s degree in urban studies in 2015 through the 4Cities programme, which entails a semester of study and practice in each of the programme cities, Brussels, Vienna, Copenhagen and Madrid. She co-authored a book of interviews ‘Ženske hronike’ (‘Women’s Chronicles’) in 2014, seeking to show women’s perspectives on living in northern Montenegro through the times of post-socialist transition. She lives in Montenegro.